Allow them to create the most vibrant of masterpieces with our Giant Rainbow Ink Pad. 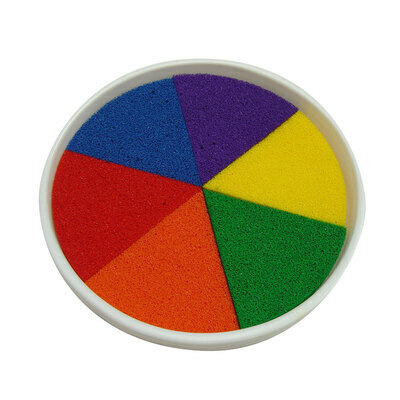 Filled with non-toxic and childsafe paints, this large ink pad features 6 individual colours that can be activated with a little water. A great tool for creating finger, hand or foot prints with your youngest pupils, they are also great for allowing children to explore as they reduce the risk of spills and drips usually noted with traditional paints. The robust plastic holder can be easily passed around the entire class and is a great addition to your Arts and Crafts collection. We also have Giant Paint & Ink Pads in individual colour pots or Colour Blocks in large and assorted colour sets.